← 311 "Brake My Wife, Please"
A giant baby picks up doll versions of the simpsons. "Sandwiches should not contain sand." "Marge makes Bart quit hanging out with Milhouse after the two are caught invading the Flanders' home. She then starts a peer group based around Native American life for Bart, Nelson, Ralph and Database to participate in. When Bart finds out Milhouse has joined a different peer group, they soon are at odds as they see whose group can do more community service around Springfield." Bart and Milhouse find themselves outside and bored after Marge refuses to let them watch South Park. After tying a thread to a fly which flies through the window of the Flanders house and is eaten by a cat, Bart and Milhouse find themselves inside the home, unsupervised. They cause some damage and find Ned's collection of Beatles memorabilia in the basement. They drink from cans of a 40-year-old novelty beverage and start to hallucinate, with Bart seeing Milhouse as John Lennon through various stages of his life. Ned and the boys return to their home to find the house "slightly askew", and they flee to their panic room and call the police. Ned then sings songs to his sons, making them even more scared. The police arrive and capture the boys. Their parents are called, and as part of Bart and Milhouse's punishment, they are sentenced to spending all their time under parental supervision. Bart is also no longer allowed to play with Milhouse, who Marge believes incites Bart into his bad behavior. Bart joins the "Pre-Teen Braves" and Homer becomes the tribe leader, but when Homer fails in his leadership skills, Marge takes over. Nelson hugs and kisses a tree thinking that it is his long lost father. Marge takes the boys on a nature walk they meet a Native American (Mohican) who shows them a field that is in need of restoration after Homer dumps some rubbish there. The "Pre-Teen Braves" return to the field to begin their clean-up effort, only to discover that the "Cavalry Kids", of which Milhouse and his father are members, have already done the job. The two groups go to war and try to outdo each other in doing good. When the opportunity to become batboys at a Springfield Isotopes game is on the line, the two sides redouble their efforts for their candy sales. The "Pre-Teen Braves" lace the "Cavalry Kids' " candy bars with laxatives and believe they are going to win. Unfortunately for them, the senior citizens, in need of relief from constipation, buy the "Cavalry Kids" a win. 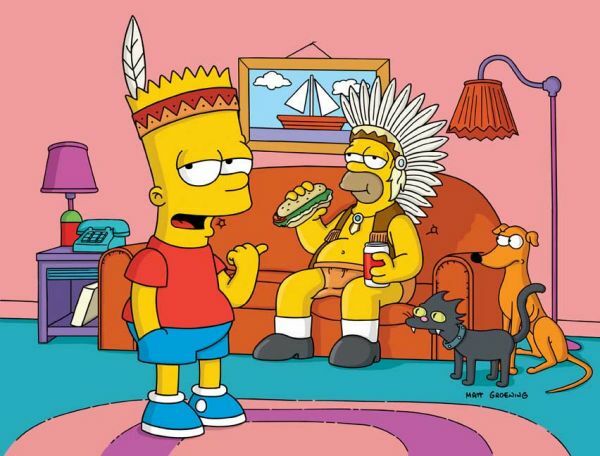 At an Isotopes game, the "Cavalry Kids" are delayed from arriving when Bart and Homer place a sign that says "free VIP parking" and the "Pre-Teen Braves" take their place singing their version of the national anthem. The crowd becomes angered by the version of the anthem that is being sung, and when the real "Cavalry Kids" arrive, a fight breaks out between everyone in the crowd. When the image of Marge crying is shown on the Jumbotron, the fighting ends, with the Sea Captain suggesting that they not sing a "hymn to war, like our National Anthem, but a sweet, soothing hymn like Canada's National Anthem". Everyone present sings "O Canada" and joins hands to form a maple leaf on the baseball field. In the end, Bart and Milhouse sum it up by saying that they've learned that: "War is not the answer, except to all of America's problems." Modified on July 15, 2017, at 07:16.